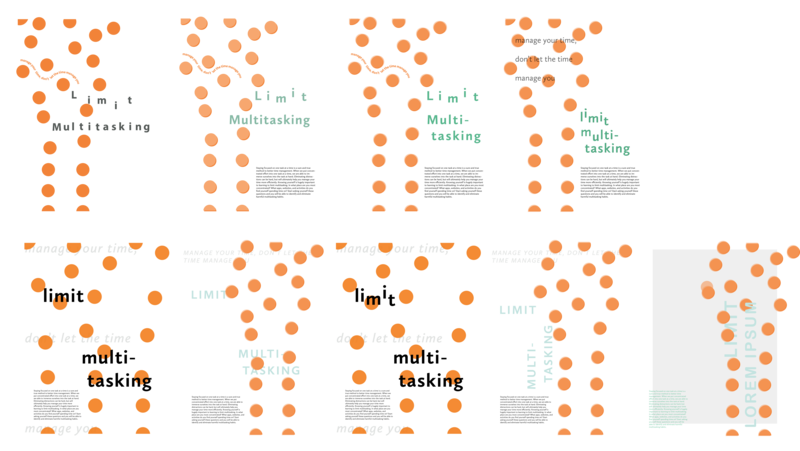 Working in collaboration with two classmates, William Su and Stephanie Chen, I designed a visual system around time management for college students. As college students learn to live on their own, managing their relationships, school work, and self care is a crucial skill to have. Beginning with only this topic as a starting point, me and my team came up with a cohesive group of tools including a series of posters, a handheld planner, and a mobile app that could be used to help students better manage their time while in the midst of the busyness of college. Before jumping into the visual characteristics of our system, we spent concentrated time on first building a character and tone to our design concept. Finding that many college students are often bombarded by “resources” when they enter college, we set out to create a product that was visually unique, that would interact with the students in a new and exciting way. We were also conscious of the different time mangagement experience that each college student was “walking into the doors” with. Finally, we did user research to hear from actual college students and their experience with time management– the tools they use, the strategies they take, and the ways they are motivated. From this point, we began designing a visual system to address the problems we found in the research portion of the project. Creating type spec sheets and gathering inspiration that fit our tone, was our first step. We then moved on to creating a graphic form that embodied our topic and product ideas. 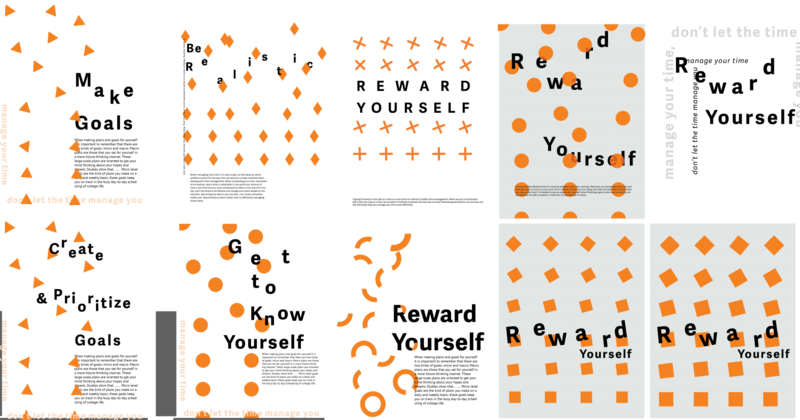 With the concept of time management as helping students to organize and schedule the many tasks and responsibilities that they have, we created a graphic form that visualized dots transforming from disorganized to organized. This graphic form along with our vibrant color scheme carried through each of our products (digital and print) to create one story about the power of practicing time management in college. We iterated on many different shapes, sizes, colors, and other graphic elements in order to convey a sense of organization in motion. Another key aspect of our design process was creating a tone through the language we used in each of our products. In order to create a persuasive argument to our college student audience, we came up with catch phrases that would help students begin thinking about why time management is important and how they can realistically implement time management strategies into their own lives. We came up with this phrase to motivate our audience: Manage your time, don’t let the time manage you. Setting out to create an app to help students manage their time and responsibilities, we began with identifying our users needs. 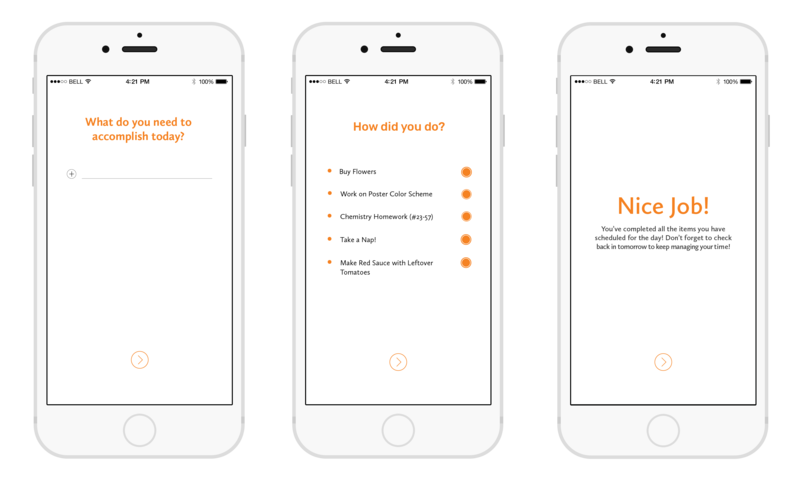 With the identified pain points of students current experience with time management tools that we found through user research, we came up with key features to offer within the app. We then did competitor research and identified what current time management and to-do apps are doing well and not well. 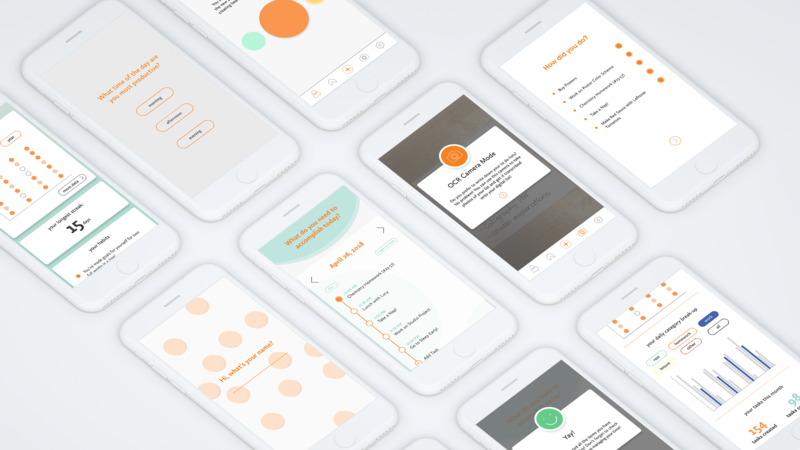 With our background research, visual system, and ample inspiration, we designed over twenty different screens and then prototyped those screens to create a full app experience. One of the key features of our app design that set it apart from other competitor apps was the the workflow of the app. 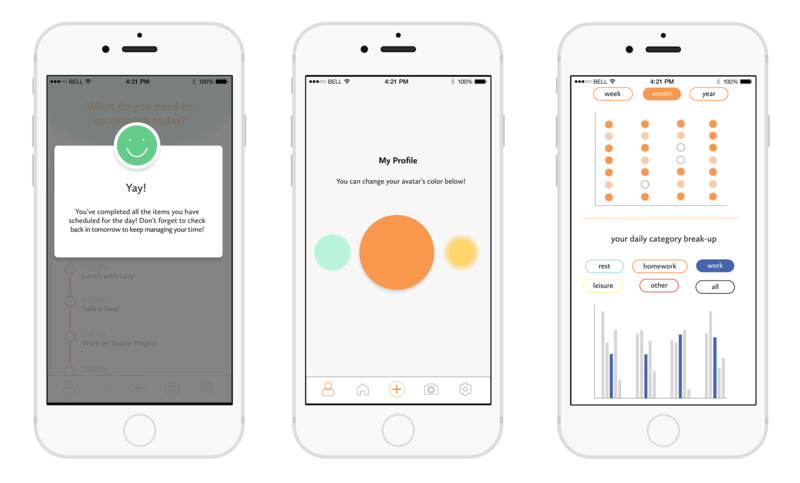 As time management is something that differs from person to person, we identified areas where the app could be personalized to the specific user. We then used our research on habit-making and its positive impact on change and motivation to design a feature around daily check-ins that we imagined would eventually become a habit in our users day in and day out. We also wanted to bridge the gap between those users who prefer written lists versus those that prefer digital lists by utilizing OCR – a technology that can identify text from a picture. By creating this feature, we intended that users might write down a physical list and quickly import that list to the app in order to track their personal statistics and deadlines. To further interaction, we introduced rewards to motivate the user to continue tracking their personal time management. The rewards came in the form of personalization and encouraging messaging. Our flat print piece was a posters series centered around five important steps to creating better time management habits. 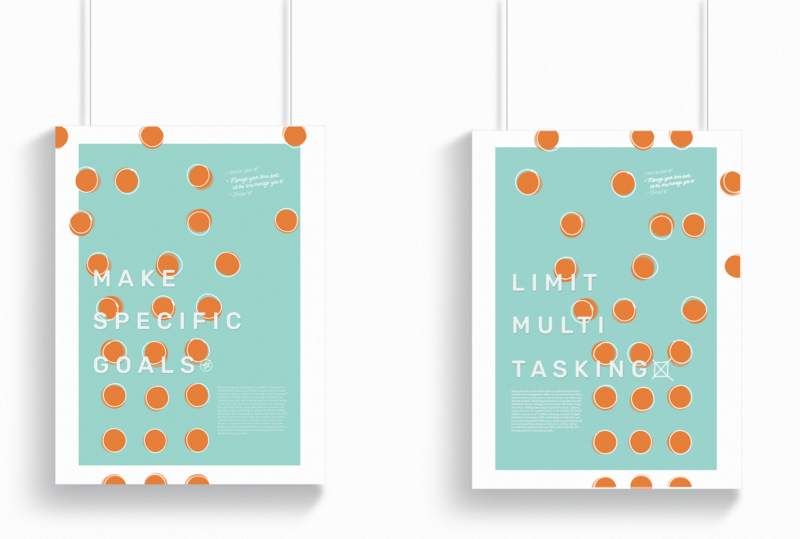 Each poster worked off of the same visual system of dots organizing themselves. The context of these posters were intended to be in a dorm hallway or campus library. It was also important that these posters could be viewed on their own or together as a set. Some of the important visual and design features that we considered was the viewing distance, color, visual hierarchy and the underlying dot pattern. 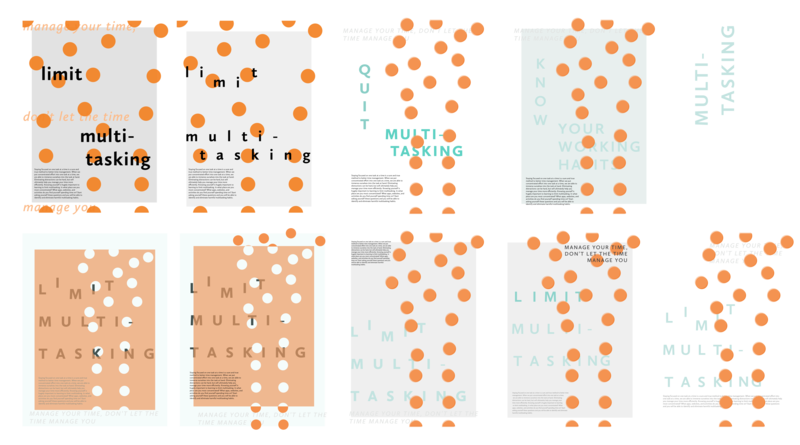 Each poster in the series addressed five important issues of time management: Limit multitasking, reward your hard work, know your habits, make specific goals, and be more realistic. In addition to a poster series, our system also included a handheld planner for students to use to manage their many responsibilities and tasks. This planner’s main purpose was to provide a physical object to help those students who prefer or work better with pen and paper. 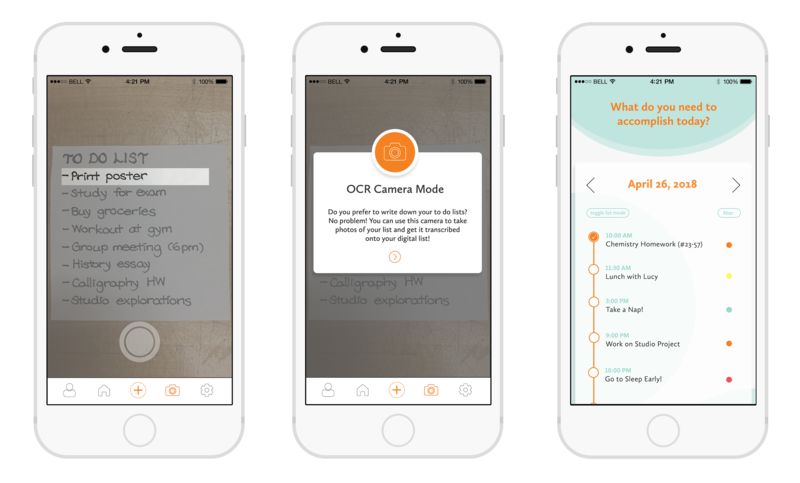 This handheld piece was designed to work in tandem with the mobile app through the OCR photo tab of the app where one could take a photo of the to do list and it would be transcribed onto the mobile app. From start to finish, creating a visual system that was cohesive for both digital, and print products gave me valuable experience. I learned important lessons about color, hierarchy, and viewing distance. Creating a mobile app prototype also introduce me to mobile interface and standards. This project gave me a chance to try my hand at creating an identity that could mold itself to different mediums. 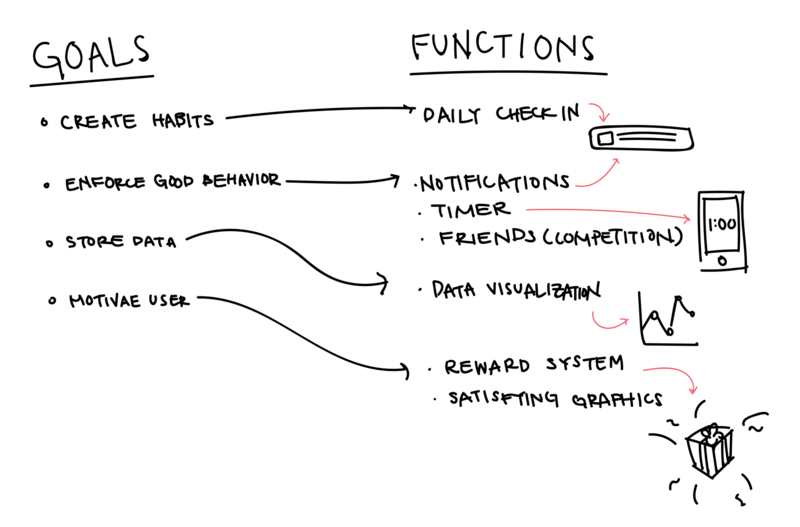 A animated gif showing the progression of graphic form and poster development. Poster iterations that show working through different shapes and movement to create a feeling of organization. 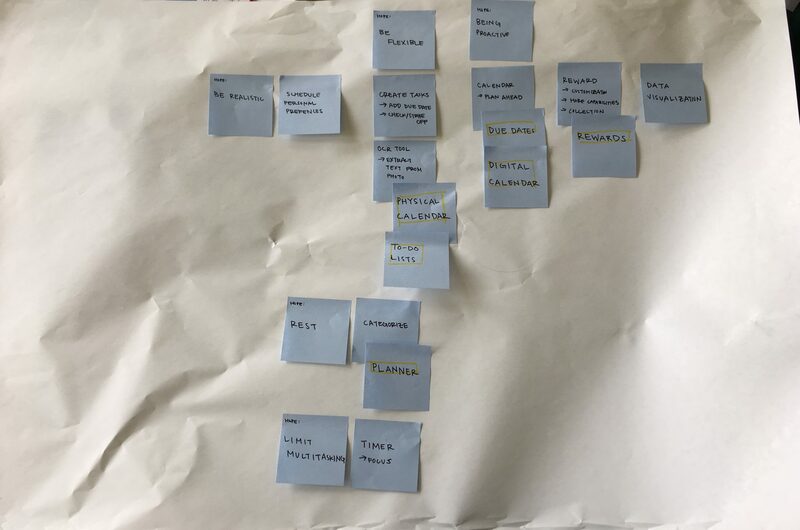 A sticky note exercise used to identify key features of the app from user research and competitor analysis. Key findings from user research and analysis.